Do you ever think you have this really great idea and then come to find out maybe you heard or saw that idea somewhere else? I think that may be what happened to me when I created this recipe. I’ll preface this story with a couple of essential factors. First of all, I adore any kind of fish or chicken that is encrusted in any variety of ingredients; nuts, breadcrumbs, crackers, tortilla chips, crushed Oreos…just kidding on that one, but you get my point. Second of all, I have a mild obsession with panko bread crumbs and parmesan cheese. Third of all, I have an obscenely large jar of Dijon mustard from Costco that must be used. Fourth of all, I’m trying to eat relatively healthy for the upcoming bikini season. Fifth of all, (I know getting a little ridiculous) I can’t seem to consume enough seafood lately. Whew, ok.
A tiny little light bulb went off in my head the other day, and it went a little something like this. Hmm, I’m feeling like fish of some sort for a nice, healthy dinner tonight. Now that’s decided, what fish should I use?? Ahh! I’ve got it; salmon would be a fabulous choice. 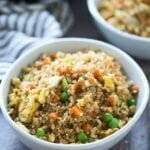 Now that I’ve got my protein, how am I going to prepare it? 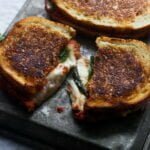 I look in my pantry and grab panko bread crumbs, cheese, and herbs and make a nice little topping out of it. Now, how am I going to get this breadcrumb mixture to stick?? Another light bulb. Well, I’ve got all this Dijon I need to use, I’m sure that would be the perfect adhesive. Thus, a recipe was born… Sure it didn’t go exactly like that, but close enough. After I’ve patted myself on the back for making this wonderful salmon, I sit down to relax and watch some of my favorite Food Network shows. Barefoot Contessa just happens to be making an appearance and lo and behold, what is she making?? A panko crusted salmon filet, eerily similar to mine. My first thoughts were, Ina, how could you steal my idea? Since you know, she totally knows who I am. I think about it for another minute as I watch Ina rip off my recipe. 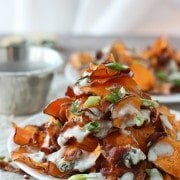 I’m fairly certain I’ve seen every episode of hers; could it be possible that I’ve seen this episode before and unconsciously created a similar recipe in my head? I’ll never know for sure if that’s what happened but I think it’s safe to say that there’s a pretty darn good chance that’s the case. Either way, you should try this dish. 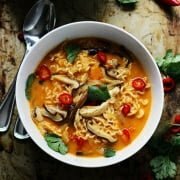 It’s super quick and easy, yet simple and delicious. Here’s my version of Panko Crusted Salmon. Preheat oven to 400 degrees. Mix melted butter, panko, parsley, chives, and cheese in small bowl. Season to taste with salt and pepper. 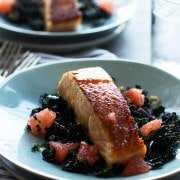 Season salmon filets with salt and pepper. Heat olive oil in large skillet over medium high heat. 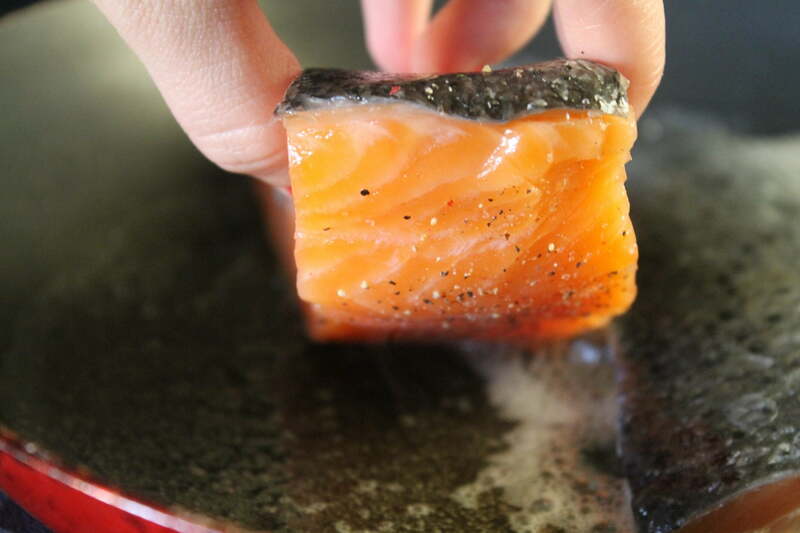 Sauté salmon in oil skin side up until brown and crispy about three to four minutes. Flip filet and turn heat off. Spread ½ tablespoon Dijon mustard over salmon. 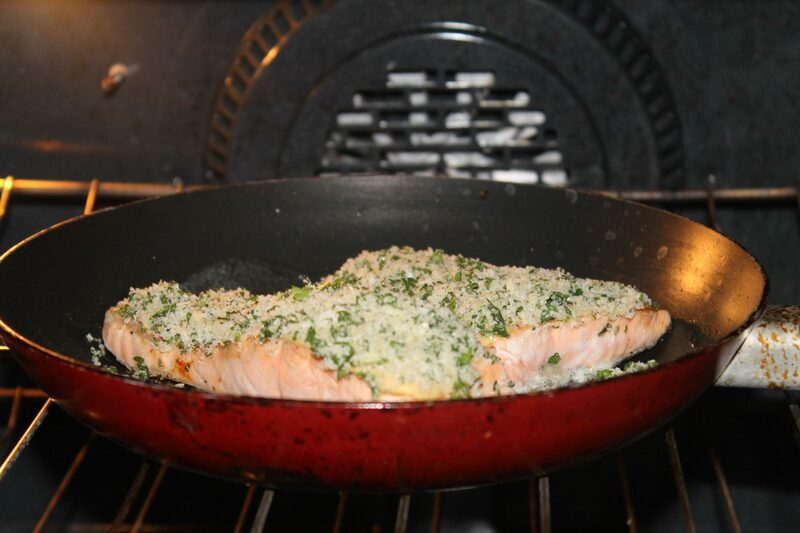 Cover with equal portions panko and herb mixture. Roast in oven for about five minutes. Switch oven to broil. Broil salmon until bread crumbs are golden brown about one minute. Serve. 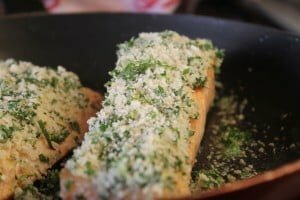 7 Responses to "Panko & Herb Crusted Salmon"
Just don’t tell Jeffrey and Ina won’t mind..
Mmmmmmm I’m totally going to make this Friday 🙂 Love it! Love your website Nicole!!! Jon and Jared are fly fishing in Alaska next week and will ship back lots of fresh fish. Can’t wait to try this salmon recipe. Thanks! Hi. I was wondering how would the order go if I were to first broil my fish in the oven. 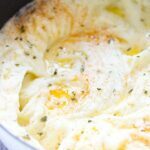 would i need to add the mustard, panko crumbs and herbs before i broil it in the oven or would that look different? You could do the whole thing in the oven if you’d like, but yes I would put the mustard, panko, and herbs on beforehand. Hope this helps!